The coolest mission you haven’t heard of just hit a major milestone: the Japanese Hayabusa 2 probe has reached its destination, the asteroid Ryugu, and just deployed a pair of landers to its surface. Soon it will touch down itself and bring a sample of Ryugu back to Earth! Are you kidding me? That’s amazing! Hayabusa 2 is, as you might guess, a sequel to the original Hayabusa, which like this one was an asteroid sampling mission. So this whole process isn’t without precedent, though some of you may be surprised that asteroid mining is essentially old hat now. But as you might also guess, the second mission is more advanced than the first. Emboldened by and having learned much from the first mission, Hayabusa 2 packs more equipment and plans a much longer stay at its destination. That destination is an asteroid in an orbit between the Earth and Mars named Ryugu. Ryugu is designated “Type C,” meaning it is thought to have considerable amounts of water and organic materials, making it an exciting target for learning about the possibilities of extraterrestrial life and the history of this (and perhaps other) solar systems. These “MINERVA” landers (seen in render form up top) are intended to hop around the surface, with each leap lasting some 15 minutes due to the low gravity there. They’ll take pictures of the surface, test the temperature, and generally investigate wherever they land. Waiting for deployment are one more MINERVA and MASCOT, a newly developed lander that carries more scientific instruments but isn’t as mobile. It’ll look more closely at the magnetic qualities of the asteroid and also non-invasively check the minerals on the surface. 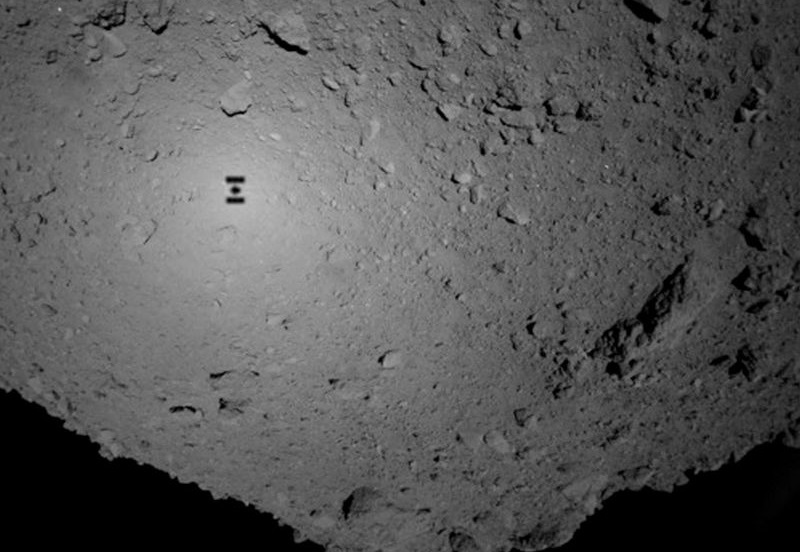 The big news will come next year, when Hayabusa 2 itself drops down to the surface with the “small carry-on impactor,” which it will use to create a crater and sample below the surface of Ryugu. This thing is great. It’s basically a giant bullet: a 2-kilogram copper plate mounted in front of an explosive, which when detonated fires the plate towards the target at about two kilometers per second, or somewhere around 4,400 miles per hour. 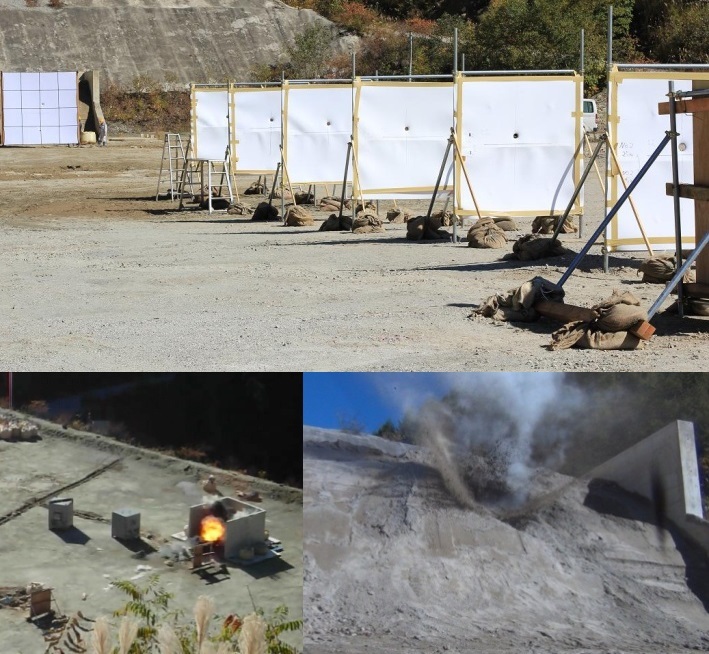 Hayabusa 2’s impactor in a test, blowing through targets and hitting the rubble on the far side of the range. The orbiter will not just observe surface changes from the impact, which will help illuminate the origins of other craters and help indicate the character of the surface, but it will also land and collect the “fresh” exposed substances. All in all it’s a fabulously interesting mission and one that JAXA, Japan’s NASA equivalent, is uniquely qualified to run. You can bet that asteroid mining companies are watching Hayabusa 2 closely, since a few years from now they may be launching their own versions of it.